Red sea urchin - Kealakekua Bay, Hawaii by troy mckaskle is licensed under CC BY-SA 2.0. Image may have been resized or cropped from original. In Hawaiian language, “Wana”. Pronounced “vah-na”. Though they are dangerous to step on they are eaten by locals and considered a delicacy. They taste like opihi. If you’ve never had opihi, then you’re really missing something. I remember having them freshly picked with soy sauce (shoyu), ginger, garlic, and maybe something else mixed in to make it a secret recipe – I can’t recall everything exactly. I do remember the taste was absolutely lovely. I’ll be trying urchin next time! Stepping on an urchin is a very bad experience. Three species are dangerous in Hawaii, those named above in the subheading. These are wicked circular or oval spined beasts up to ten-inches across, that attach to coral, rocks, and other submerged structures directly under some of the prime surfing spots in Hawaii. 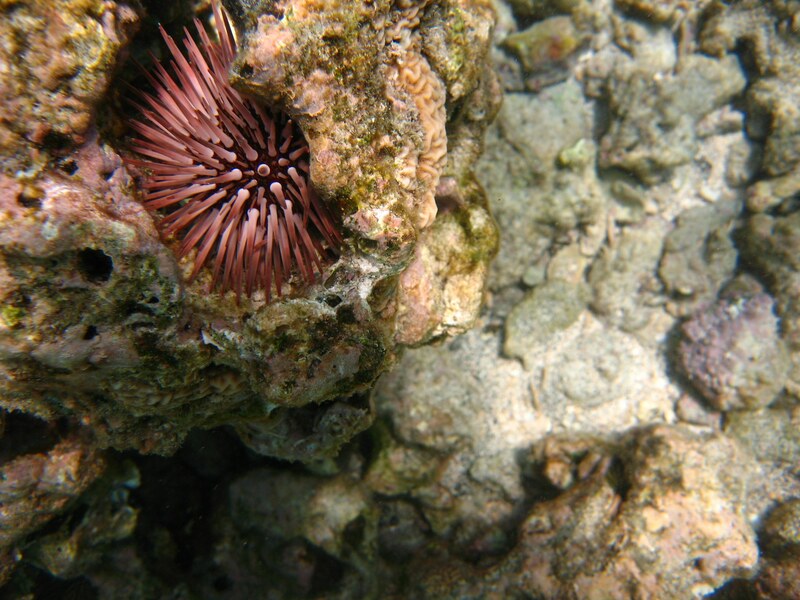 This long spiny urchin is the scourge of surfers all over Hawaii. If you have lived in the islands for any amount of time, you already know someone that is living with wana barbs inside their foot, which, with time, dissolve. The problem is, before they dissolve, you are going to go through tremendous pain from the pointy spines, the venom they carry, and possibly infection, as a result of punctured skin. I’ll talk more about the risk for infection when you cut yourself in Hawaii’s waters later. Wana venom is released through the shorter hollow spines as something contacts the sharp tip. Though you may have trouble seeing them if you are snorkeling or diving because they collect organic debris, and sometimes small pebbles, you know immediately if you’ve stepped on one. It is nothing like a coral cut – which often isn’t even felt. The spines can break off and lodge inside the tissues of your body, and need to be removed as much as possible. The area around the punctured skin will be stained purple or black, the same color as the offending organism. This fades with time. Hospital or clinic treatment is highly advised because all medical personnel that deal with this problem have been well trained on how best to treat the site of injury. There are even substances that can be applied that help soften the barbs so they are absorbed into the skin faster than through the normal process. Probability of Encountering – Unfortunately, if you spend a lot of time in the water, you are likely to put your foot down on a piece of coral or rock and step right onto a long-spined venomous sea urchin. Wana are very common. It happens. It happened to me only a couple of times, and I never suffered with them broken off in my foot like a lot of people do. It doesn’t take long to learn not to put your foot on the coral in any circumstances. Prognosis – Good in most cases. It is painful, and even debilitating for a while, but eventually without secondary infection, it works itself out. Coral is alive, but it feels like a very sharp rock when you touch it. The danger is in stepping on it or brushing against it because it is so rough, that it can scrape the skin and even cause lacerations, very easily. Lacerations, Scrapes – Treat immediately, don’t continue playing in the water until you’re ready to go get it treated. If you’re bleeding, you’re ready to go home. If you don’t know what you’re doing, go to a clinic and have them clean it out. I know it sounds funny, to have a clinic clean out your scrape or cut, but you don’t want it to get infected. Infection is very common after a coral cut, I’d say it’s the rule and it happens nearly every time. Did for me! Prognosis – Probably fine, infection of some sort is normal, but most people recover fully. However, because there is usually some form of infection present, whether from the coral itself or bacteria in the water, coral cuts can take up to months to heal. Be aware that some people are allergic to the substances in coral that can enter the body through a break in the skin. Signs of infection and anaphylactic shock symptoms should be dealt with immediately. Precautions – Of course you don’t want to ever step on coral or brush against it for any reason. Some surfing spots have coral reef under the breaking wave, that’s why it’s breaking! Do be careful not to be caught out on a coral reef when the tide has gone out and left you in a place you can’t do anything else but crawl across or try to paddle your surfboard or bodyboard over top of the coral reef. Not a good position to be in! Been there myself in Waikiki and at Magic Island, Ala Moana Beach Park. I don’t ever want to be in that position again, I probably don’t need to tell you. In Hawaiian language, “Poniuniu”. As strange as it sounds, walking along a beach or diving in Hawaii and picking up a Conus shell with a snail still inside, can lead to excruciating pain, and possibly even death. Yes, snails in Hawaii can be potentially deadly, though there have been no fatalities here yet. There are thirty to forty species of Conus snail in the waters of Hawaii. The largest, the leopard Conus (Conus leopardus) can reach 9 inches in length. The three that are especially dangerous are the textile, striated and marbled cones. These dangerous snails are carnivorous and hunt marine life nocturnally. The snails have a harpoon-like ‘tooth’ that contains potent neurotoxic venom that renders prey helpless. The venom is also cytotoxic, destroying cells of the organism. There is no antivenin available. Probability of Encountering – Very low, unless you are actively looking for shells on the beach or in the ocean. Only shells with live snails in them can harm you. I have heard stories of people putting shells in their pocket, and the snail stings them in the thigh, through the cloth of the pocket. Stings – Small Conus snails can give a painful sting. Larger snails can induce respiratory failure and death. Typically stings include intense pain, some swelling, numbness, tingling, and vomiting. Symptoms can be delayed by days. Severe cases involve muscular paralysis, vision difficulty, and respiratory problems. If you are stung, watch for signs of going into anaphylactic shock and seek treatment immediately. As stated, there is no antivenin, and treatment involves providing life support until the venom is metabolized by the victim. Prognosis – For small snails, the prognosis is usually good. For large snails, better to get to the hospital quickly. There have been no reported fatalities from these snails in Hawaii to date. Portuguese Man-of-War, a stinging invertebrate, is probably the most abundant threat in Hawaii’s waters. These are quite common on the windward side of the island. I body boarded frequently at Waimanalo, and Bellows Air Force Station. It seemed these pests were there every time I went. Stings – There are varying degrees of stings, and reactions to them. I spent many hundreds of hours in he ocean in Hawaii. I was stung repeatedly by tentacles of these jellyfish-like monsters. I remember getting stung and just staying in the water because it wasn’t that bad. I think I just wasn’t that allergic to the venom after a while and so many stings. I remember having red welts across my back, legs, arms, cheek, and other places, and they stung a bit, but nothing like what many people describe as the worst pain of their lives. Do be exceptionally careful though, because you might be a person that reacts very badly to the venom. Most people urinate in a cup and pour it on their stings. It appears to help. Prognosis – Red welts and some pain, some itchiness is apparent for up to two to three days for most people. If you’re going to have an allergic reaction, it usually happens within the first few hours of exposure to the toxins. Precautions – These pests are present in greater numbers when the wind is coming onshore and blowing them into the beach. You can usually find some on the beach first, and that will notify you that they are also in the water. If you see one man-of-war floating on the water, get out immediately, there are likely hundreds more around. I don’t remember being stung through a shirt or shorts, so covering up with a long-sleeve surfing shirt can help mitigate the extent of a sting. The winged box jellyfish is one to three-inches long with tentacles around two feet in length and appear approximately seven to ten days after the full moon. They are present for a couple of days, and then aren’t usually to be found. There is the occasional oddball that can be found anywhere, so caution is always indicated. They show up a week after the full moon on the leeward shores of the Hawaiian Islands. Lifeguards display signs warning if jellyfish are present. This is another reason to swim at beaches that have lifeguards. Not all Hawaii beaches do. Stings – Stay calm and remove the tentacles if you can see them, using something other than your finger. Use something like a piece of cardboard, tweezers, sock, or something else. Do not touch the object again once used to brush away the jellyfish flesh. Flood stings with vinegar or isopropyl alcohol for at least thirty seconds, for minutes if possible. Once you have done that, apply the “Safe Sea Jellyfish After Sting” gel. You can get it from BuySafeSea.com. Don’t rinse with freshwater, as the nematocysts of the jellyfish will continue to release toxins into your skin. Do not use ice or hot water either. Transport victim to hospital if any serious breathing or consciousness problem occurs. Prognosis – The pain from the winged box jellyfish is much more intense than that of the Portuguese man-of-war or other jellyfish for most people. The other way you can tell is that the pain from the box jellyfish lasts for around eight hours, and not just fifteen minutes to an hour as with the man-of-war. Scarring can last for years for the box jellyfish, and only days for the man-of-war. Keep in mind that nobody has died from a box jellyfish sting in Hawaiian waters. You will likely be fine. Treat stings with vinegar and see a doctor or emergency room for any severe symptom related to anaphylactic shock. Precautions – Lifeguards keep a vigilant look for box jellyfish and sometimes close entire beaches if there is a threat. If you are swimming on a beach without lifeguards, you must be aware that jellyfish, man-of-war, sharks, and other dangers might be present (undertows, large surf, etc.). It is better, if you don’t know the ocean well, to attend only beaches with lifeguards present. Beaches that are prone to having winged box jellyfish: Ala Moana Beach, Waikiki Beach, Hanauma Bay, Makaha Surfing Beach and Pōka‘i Bay. I had been snorkeling at a deserted beach on Maui for a few hours. As I came in to the shallow water I sat down and pulled off my fins. Suddenly I felt an excruciating pain on the inside of my left thigh. I instinctively jumped up and ran in to the beach, slapping my thigh to get whatever was burning my leg, off of me as fast as possible. When I got to the beach my leg was on fire with pain. Up to that point the only pain I had ever felt that was comparable was being stung by the barbs of a stingray that ripped open my foot after I stepped on one while wade fishing in Florida. The pain in my thigh from this sting was almost making me lose my mind, it was so strong. I felt my breathing become labored and I wondered if I was going to die right there in front of my friend. I can’t even describe the pain, but it was like someone had poured battery acid from a car on my leg and it was eating through to my bones. It was that intense. Peeing on it didn’t help. Fresh water didn’t help. We went to the doctor, who watched me closely for signs of going into shock. I was treated and got released in a few hours. I had a 5-inch diameter road map of thick lined welts on my leg for about six years. It slowly faded away and today I can only see a slight mark where that box jellyfish got me. I have been stung by many things in the past. The box jellyfish and stingray are two that you could not pay me enough to ever endure again. The pain was excruciating. Do be careful in Hawaii’s waters! I have had my share of cuts made by coral while surfing and bodyboarding at various spots on the islands. When I first arrived on Oahu I was fearless and stupid, emphasis on the latter. I’d go wherever the waves were without much consideration for the sharp coral reefs underneath. I had a coral cut or scrape a couple of times per month on average. After two years of this foolishness I noticed I was getting a boil every now and then, somewhere on my body. The location was different all the time, but usually on my upper torso, not my legs so much. If you’ve had boils, you know they are no fun. They’re an annoyance. However, I began having them on average once per month, every single month, without fail. This went on for about two years, even after I moved up to New York City. Multiple rounds of very strong antibiotics eventually put a stop to the recurring infection. It was then I learned from some of the best dermatologists in the world, that the Pacific Ocean around the islands of Hawaii – especially Waikiki, is filled with opportunistic bacteria like Staphlococcus and Streptococcus! If you get a coral cut, you have a good chance of getting an infection from some nasty bacteria in the water. It is essential to have your wounds cleaned out professionally, and still, you have a chance of coming down with boils or something else. Prognosis – As I mentioned above, I’ve had many coral cuts while surfing and bodyboarding, and all my friends have too. The worst thing I’ve ever seen happen was my own recurring staph infection that took many courses of antibiotics to fix. Usually infections are mild to moderate and hospitalization is not necessary. We gave an entire article to the fascinating topic of sharks in Hawaii because it is such a major, and mostly irrational fear, that most of us have. Click here for info: Sharks in Hawaii! As you can see there are a few dangerous marine animals and bacteria to keep up to speed about if you are planning on spending time in the oceans around the islands of Hawaii. Most things can be avoided by being smart – including sharks. There are times of day and night they can be found, and preferences they have for feeding which you can be aware of that will help you avoid them. Probably the biggest risk of injury you face in the water is a sting from the abundant Portuguese man-of-war that floats on the surface and come into shore during onshore wind periods. California Tony checking in and laying down the facts! Love it… thanks for taking the time Tony! My expertise is in venomous snakes, and well, I won’t be sharing that on this website considering there aren’t any in the islands. Hope Hawaii doesn’t get the brown cat snakes that Guam has, anytime soon! Hi, I went snorkeling in snarks cove in Oahu, a day or two later I started to puff up like a marshmellow. My husband kind of shrugged it off so I spent the next few days in uaho walking with crutches which I had because I have a bad knee which goes out on me all the time. 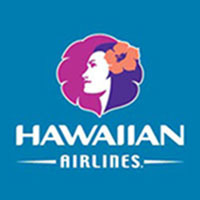 Our next stop was the big island the problem is I don’t remember retuning the car going to the airport getting on the plane or off. The next thing it member was waking up in the hotel in Kona 2 days after we had arrived. My husband was out but I found a stack of paper work from the air port that he had refused to let them to air lift me to Hilo because I was unconscious. That he would take me to the Kona er right away, he didn’t. However since the airline had both our phone numbers they called me to see how I was doing. (My sister works for the Airline so we travel through their parent company all the time) their call is what woke me up and they told me everything. So when my husband returned I told him the airline called and told me everything why am I not in the hospital, he gave some crappy story gave up and took me. They could not for sure figure out what I had come in contact with but an infection had set in and worse my memory began to rapidly decline, I couldn’t tell them my soical security #, my age, where i was, how long we had been there, where we had been before. Now I am under the close eye of a nurologist because I’m still in this mental fog. I can’t find anything in Hawaii that could cause such rapid nurological symptoms. The hospital in Kona took enough blood for them to test and to ship to standford because we live in the San Fransisco Bay Area so they just emailed the other day that they received my blood and will be looking into it. Every week since I have to go in to have my blood taken and be pumped with several antibiotics and antiviral meds as well as I’ve been set up for several rounds of dialysis. Do you know of any creature bug plant that is a nurotoxin in Oahu? I feel like I’m losing my mind! I don’t know of anything like that. I’m sure the doctors will figure it out before we do. Maybe someone reading this has had or heard of someone with a similar experience. That is a horrific story! Get well!!! Aloha! So I got stung before by 2 out of the list, Sea Urchin and Portuguese Man O War. At least Hawaii doesn’t have whats probably the most dangerous ocean critter that Thailand has…..the jet ski mafia gangs! This one will give you excruciating stings all over the body from getting mobbed and the excruciating sting in your wallet! Oh, you forgot one though, the itchy fine sand in the shorts from Bellows Beach. I think if you don’t have vana barbs inside your feet, you’re not really a local. That should be the test for Kamaina discount.